Dental implants which are inserted into the jaw bone during a surgical intervention, serve as a replacement for a lost tooth root. Dental implants consist of a screw made of titanium or ceramic. For this we predominantly use products from a leading manufacturer of dental implants. We then attach a dental prosthesis to these artificial abutments. In this way an individual tooth (with a crown) or a larger dental gap (with a bridge) can be provided; also a removable prosthesis can be attached with the aid of dental implants in the jawbone. The patient should be in general good health. It is vital that there is sufficient bone available in the jawbone that is of good quality, as is the willingness to carry out impeccable oral hygiene in the framework of the essential necessary aftercare. With the implant Basic, costing CHF 3,200, the mounting is titanium pre-fabricated and is provided with a crown from our laboratory. This basic dental implant version is particularly suitable for the posterior teeth area. 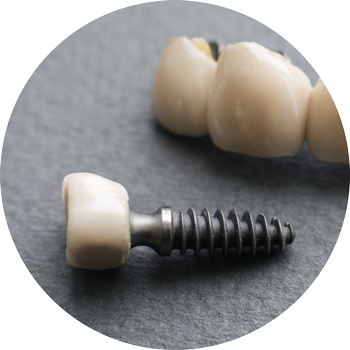 With the implant Flex, costing CHF 4,500, the mounting is individually produced from titanium or ceramic and is provided with a highly aesthetic crown from our Swiss laboratory. This dental implant solution is necessary for difficult bone conditions and fulfils the highest aesthetic requirements. Your dentist performing the implant is happy to advise you as to which dental implants are the best solutions for you.